As I write this, the Penticton Peachfest parade has been underway for 1.5 hours and it’s been raining almost the whole time. Amazing, considering we’ve enjoyed an incredibly beautiful summer in Penticton up to this point – hot, dry and completely clear skies day after day and month after month… until today. Actually, I did partake in the festivities for about half an hour. I listened to music of the various marching bands as it wafted up the hillside to my hot tub. Oh well, tomorrow is Kiddie’s Day at Peachfest and they too have a parade. With a better weather offing in the forecast – Ed and I will venture down to see the kids for sure. 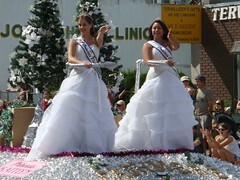 In the meantime, here are our pictures from the Penticton Peachfest Parade of 2007.